Ever since posting about Wrebbit’s “Puzz-3D NYC”, I’ve been asked where people can find them since they’re no longer available at retail. I’ve found the best place to be eBay or Amazon.com, where used ones sometimes appear. Unfortunately, a lot of the used ones don’t include the manual. While the manual is not absolutely necessary to complete the puzzle, it definitely helps, and when the puzzle has over 3,000 pieces, every little bit helps. 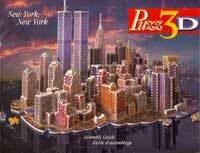 I’ve scoured Hasbro’s web site (Wrebbit is now owned by Hasbro) and have been unable to find the Puzz-3D NYC manual, including their Instruction Guides where other Puzz-3D manuals appear. For the betterment of mankind, I’ve scanned my manual and make it available in PDF format. It’s quite large, at 75MB, because it was scanned in at 200 dpi so it could be zoomed in to or printed out if necessary.